A noticeable trend we have seen amongst our clients is their growing interest in, and around the implementation of Database Server Virtualisation and Consolidation. Over the course of this year, we have brought our specialist knowledge and database skills to bear on a wide range of successful Database Server Consolidation projects. These projects have all delivered substantial strategic benefits to our clients. Examples of such projects can be seen here. This year also brought the milestone that we have been in the business of Enterprise Database Management Services for 10 years. In celebrating this decade of existence, we would like to send a big thank you to our clients, business partners, the Ascent team, as well as everyone who has crossed our path and played a role in our success over this period. We have always approached the concept of Enterprise Database Management from a somewhat different tack, and would therefore like to thank our clients for allowing us to apply what was, at the time, an unproven business model to help them overcome their data management challenges. Over the past 10 years this model of Co/Outsourcing Database Administration and Consulting Services has certainly matured and those clients who have trusted us and walked this road with us have clearly seen the value-add this model can offer. We are grateful to our clients for entrusting us with one of their most important company assets – their data – and we look forward to providing Absolute Data Excellence to our clients for many years to come. A particularly memorable moment for us this year was our strong showing in the Microsoft Partner of the Year Awards. This year, Ascent not only won the Data Platform Partner of the Year for the third time in succession, but we also won the much-coveted Managing Director’s Partner of the Year award. Being recognised by Microsoft as one of the leaders in the country in the Data Platform Space, is testament to our hard work in 2013. To furthermore receive the Microsoft Managing Director’s Partner of the Year award, the most-coveted, reserved and prestigious accolade, is both a most humbling and rewarding experience. We are honoured that Microsoft has bestowed this prestigious award on us, and we are looking forward to continue building upon this success. Another memorable moment was the celebratory event held to mark our 10 years of existence, which encompassed a company weekend away in Hazyview. This particular highlight was a most enjoyable experience for our entire team and was an especially entertaining manner for us to round off 10 years of Absolute Data Excellence. 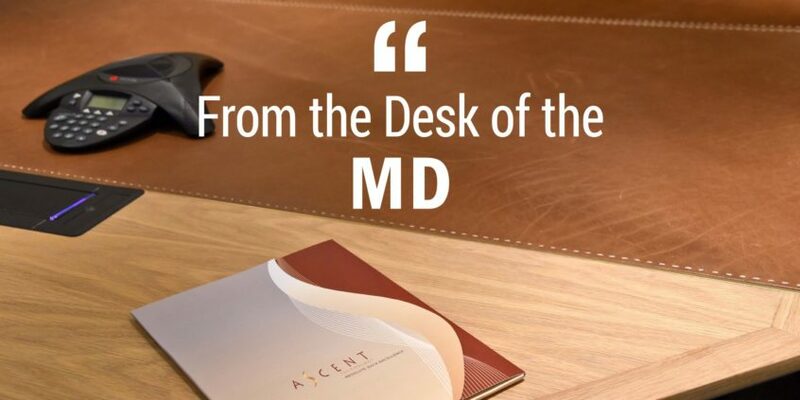 We would also like to add that we really appreciate the efforts of the entire Ascent team, for all their work in ensuring that this journey has been such a successful one for us all. Ascent is the sponsor of both the ITWeb Data Management Portal and its monthly Data Management Newsletter. This Newsletter has around eight thousand subscribers, demonstrating just how important Database Management is considered by businesses. Moreover, between the portal and the newsletter, you should have no trouble keeping on top of the latest news around all things Data Management. If you would like to sign up to the ITWeb Data Management newsletter, click here. As we head into the holiday season, we would like to once again thank all our clients for their continued support and wish you all a very happy and peaceful Festive Season. Whatever you are doing over December, please take care and we trust you will return from your vacations refreshed and ready to go, come January.